I'm currently working on a video with the sculptor, Allan Sly. Click above for more information and / or to register for e-mail notification of availability. You can also see a 30 sec (2.7Mb) QuickTime movie showing a little bit of the early work here. This video follows Paul Spooner as he attempts to make a new machine in one day. Click above for more information. I've also made two other videos for Cabaret Mechanical Theatre: How to Make Automata and Cabaret Mechanical Video. I directed this series of four, 15 minute programmes for Channel 4 (UK Broadcast) It was first shown in February 1995. 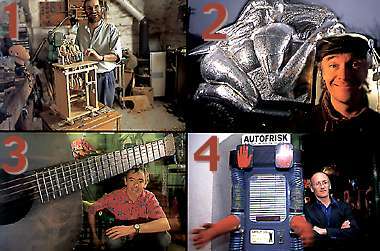 Programme One was called Mechanisms and featured Paul Spooner. No. 2: Driving Forces with Andy Plant. No. 3: Vibrations with Johnny White and No. 4: Trial and Error with Tim Hunkin. You can read what the papers thought below.